Mozart was without a doubt one of Edvard Grieg's favourite composers. When his mother gave lessons or entertained family and friends for an evening of music, it was the music of Wolfgang Amadeus Mozart which made the greatest impression on him. During the winter of 1876/77 he arranged four of Mozart's nineteen piano sonatas for two pianos by adding his own, newly composed part. What is special about Grieg's adaptations of the Mozart sonatas is that he has not reworked them in the traditional - and perhaps derogatory - manner. 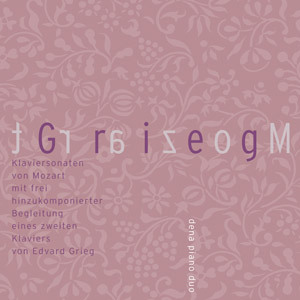 Grieg's unusual achievement lies in the fact that he has retained Mozart's text unchanged, adding an entirely new part which can be performed together with the original. When both parts are played, they interweave and become something entirely new. Two different musical styles meet in dialogue, ending up in a symbiosis of colour and texture. Mozart's music expands in time and space. Grieg's additional piano part is a romantic's respectful embrace, a romantic commentary; Mozart in romantic guise. dena piano duo is the young Norwegian pianist Tina Margareta Nilssen and professor at the Universität der Künste in Berlin, Heide Görtz. Their performances have been well received in both Norway and Germany for their musical spontaneity, clear phrasing and nuances of texture. Both pianists have a solid grounding as soloists and chamber musicians. Since 1960 the composer Arne Nordheim has enchanted both musicians and audience with a unique soundscape. His music may be considered a source to the later Nordic Sound of electronica. Today's DJs might not willingly announce "Grandfather taught me this", but that's actually the case! Nordheim's music is recently re-vitalized by publications like Dodeka and Electric by the renowned Norwegian label Rune Grammofon, and Nordheim Transformed by Biosphere / Deathprod. CIKADA DUO and 2L now bring you the world premiere recording in surround sound, as originally intended by the composer. CIKADA DUO is Kenneth Karlsson (piano/synthesizer) and Bjørn Rabben (percussion). They are joined by Åke Parmerud (elektronics) and Elisabeth Holmertz (soprano) in this production of Arne Nordheim's music. Take the stand within the percussion and let yourself be embraced by electronica, vocal and synthesizers in an extreme surround sound recording, produced by the GRAMMY-nominated Lindberg Lyd. Arne Nordheim (b.1931) has been one of the most conspicuous figures in the musical landscape of Scandinavia during the past fifty years, and is recognized as a very successful pathfinder. He has written works in most genres, inspired by the general European search for new sonorities within the traditional body of instruments. Nordheim was absorbed by the electro-acoustic medium for a period, during which purely electronic works alternate with soundscapes which electrophonic sounds are opposed to percussion or other acoustic instruments. In 1997 Arne Nordheim was elected honorary member of the International Society for Contemporary Music. 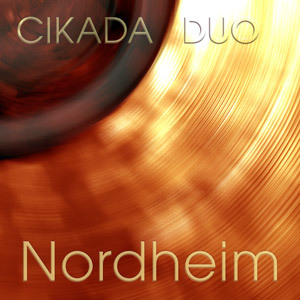 Both Nordheim and CIKADA have been awarded the Nordic Council Music Prize in respectively 1968 and 2005. The CIKADA DUO has a desire to unite fresh interpretations of existing works with new pieces written specially for them; an ambition to combine an acoustic sound world with the best that the electroacoustic has to offer. The Oslo-based Cikada Ensemble was founded in 1989 and is considered one of Europe's leading contemporary music groups. The ensemble consists of ten musicians, and under the Cikada banner, Cikada Duo is one out of three autonomous formations. In 2005 The duo has worked with many composers including James Dillon, Rolf Wallin, Richard Barrett, Carola Bauckholt, Bent Sørensen, Arne Nordheim, Sven-David Sandström, Jon Balke, James Clarke and Kevin Volans. They have over the years built up an extensive repertoire of Italian works by composers such as Giacinto Scelsi, Luigi Nono, Luciano Berio and Luigi Dallapiccola.